Whether it's Bridal, Prom, wedding or just because make up, we can help! It always helps us to help you if you can bring a photo of the look you'd like us to achieve for you. Remember, we are make up artists and not plastic surgeons!! We can apply your strip lashes FOC just remember to bring them with you. Wedding, anniversary, birthday, just because! Our fully trained in house make up artists can give you the look you've always wanted. We can create any look including contouring. This is the mother of all make overs. Our make up has been specifically designed for longevity and camera perfect flawlessness! We will work with you to create the perfect look you dream of for your perfect day. Your trial is £50 payable at your trial. If you don't like what we do, then you won't have to pay the remainder of the balance! Your trail takes place at our salon in Kings Hill. 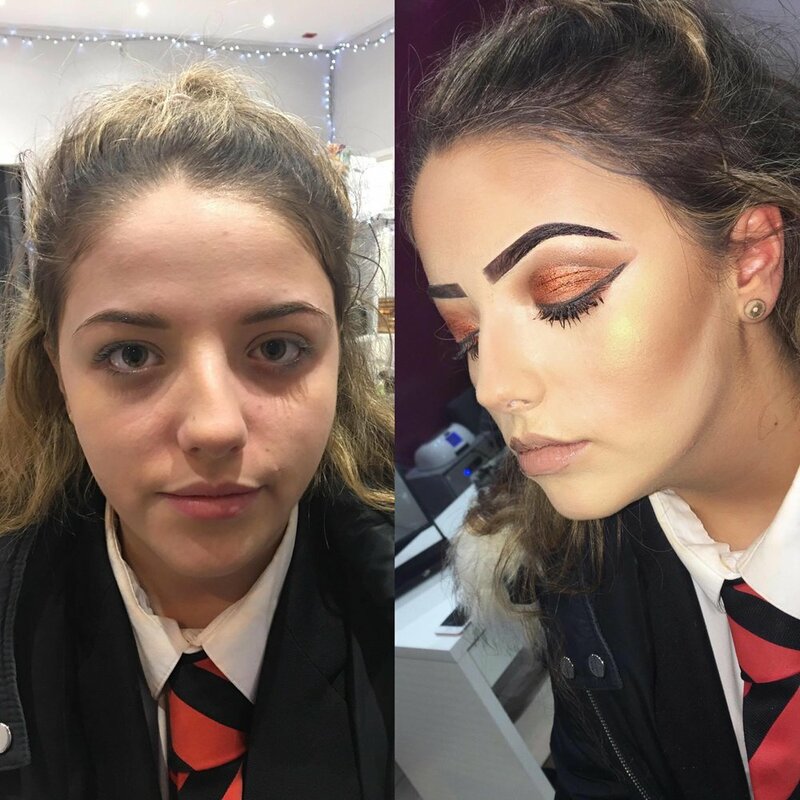 Over 12's full face of make up. Our team will work with you to create the perfect make up for all the bridal party including bridesmaids, Mother's of the Bride and special guest. Children under 12 are priced at just £11 and include eyeshadow, blush and gloss. Choose from 40 minute - 55 minute make overs depending on what look you'd like to create. Our 40 minutes make over focuses on either eyes or contouring, and 55 minutes is a full face. Valid for 14 - 17 year olds. We can be as natural or as heavy as you'd like! You can add strip lashes to your look. We'll happily apply your own at no extra charge just bring them with you and don't forget the glue! Feel free to message us a photo of a look you'd like if you want to pop by for a quick consultation. If you are under 18, you will need to bring a parent or guardian to be present throughout your appointment. Please arrive free from make up. Let us know if you're allergic to anything. Full payment is required to secure your booking. Cancellations must be made 7 days before your booking for a full refund. Bridal bookings require a 50% non refundable booking fee payable at time of booking. Advanced booking is highly recommended!